I shall believe them when they publish that their model also works on the sun ! Water is arguably the most important greenhouse gas and is undoubtedly the most difficult aspect of our climate to model. It absorbs IR, but can form droplets (clouds) and reflect the sun. It is absent from the air or scarce at low temperature. And, as you say, mars has no water of significance to climate. Nice try Simon but we all know the Mars landings were faked. Use of the Illudium Q-36 Explosive Space Modulator has been invaluable in their research..
OMG Mars is like heaven on earth! I suggest all future climate research funding comes from the grateful residents of Mars, that should keep everyone happy. The last couple of lines in the article seem to sum it up – its an artificial scarcity mecahnism at work – in other words, not only will carbon tax hit producers, it will jack up prices twice, coz theres less electricity to go around. I guess were well on our way to having our economy wrecked and a need to be *self sufficient* for our own power – good thing we have smart meters that can shut us down if we consume too much….the control grid tightens even more. Conspiracy? nope….a provable trend. The model they are using? There are four features for Mars, perhaps. An atmospheric pressure that changes from 6 to 8 mb (versus our 1000 mb) during the course of the year, an atmosphere that gets very dusty periodically, distance from the sun, and variations in solar intensity. We see changes in CO2 coverage, and (I would argue) the glaciers of Mars are active (though in retreat or at a stable state of forward rate = evaporation rate). The proportion of CO2 is stable, however. I would think they have the radiative forcing of CO2 down pat, however, and the relationship between insolation and temperature rise in a CO2 dominant atmosphere on the shortest of periods (longer periods involve sublimating CO2). The sort of information potentially damaging to CAGW. You don’t see any warmists using Mars as proof of their theories, though, do you? Interesting. Did he say this before or after he was slapped over the head with a rolled up news paper? Hey! A model that can predict the past. Good one! Very useful. Wouldn’t it be much cheaper and reliable to study the evidence in the rocks? Here on planet earth they call that geology. Since there are no anthropogens (humans) on Mars it must (Whoa) be logical (Whoa again) that Anthropogenic Global Warming does not (ie cannot) work on Mars. Hence (Ha Ha Ha Ha) since anthropogenic global warming does not work on Mars … (more sarc) it does not work on planet Earth. These scientists will stoop to anything to gain their funding on the basis that it is to do withclimate change (a non-issue (no sarc)). Models that are woefully inadequate at modelling anything with an atmosphere.. work slightly on a place that has virtually no atmosphere. 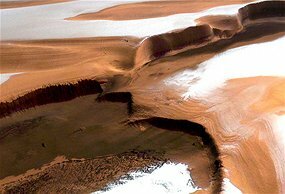 Has there been a rise in CO2 levels on Mars? If so, is it also antropogenic ? Martian farts are actually CO2 not CH4, maybe ????? I suppose it all depends on what base parameters they used for this “model” …. If they started from say 10 years ago and extrapolated from that the result ought to be spot on of course…..
Amazingly, although they can’t make their modelling work for earth, they go off at a tangent to try and prove their findings have validity – talk about blowing in the co2 encrusted solar wind…. Is there no straw they will grasp! What did you expect from the red planet ? While Uranus still spins on its side. Hmm, no magnetic field, no appreciable atmosphere, no plate tectonics, baked sterile by solar wind, half the size of Earth. It’s exactly the same, give me my grant. It’s hilarious how things are now a days. There is always someone standing up saying “THE DEBATE IS OVER!” on this issue or that issue. It’s like who what? Come on man seriously? Why have a debate if there is someone who can just decide at a drop of a hat, its over. Someone always wants to control someone else what’s wrong with FREEDOM? Looking through the comments on the page over at ACM, it appears that all those that replied, and yourself Simon, neglected to mention that Mars doesn’t have Al Gore running around causing snowstorms either!